To attract tourists in the territory of the Charyn canyon is planned to build a Park Canyon. The cost of the entire project is 1.5 billion KZT, the first stage will cost 700 million KZT. This was announced by the mayor of the Kegen district of Almaty region Talgat Bayedilov. Park Canyon will meet international standards, and will start building this year, the report said on the website of the Regional Communication Service. For construction works, a land plot of 24 hectares has been allocated. «In the near future, construction works of the first stage will begin at a cost of 700 million KZT. If the project is launched, on average every year for tourists will be provided services in the amount of 375 million KZT. 35 people will be provided with permanent work, it is planned that the budget will receive 47 million KZT annually.», — mayor of the district said. 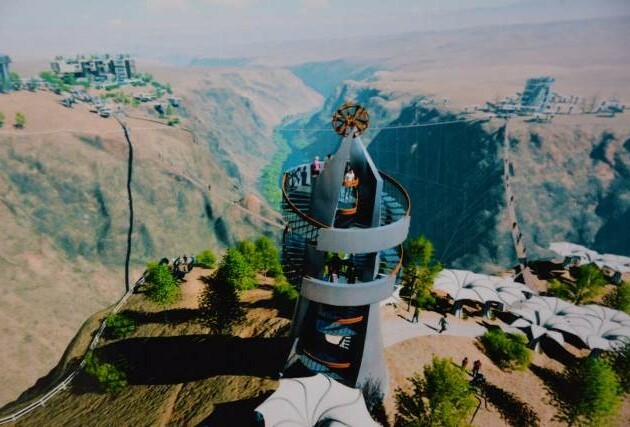 It is planned to build three suspension bridges and a hotel with 40 beds. On March 12, the Minister of Culture and Sports Arystanbek Muhamediuly said at a press conference on the development of tourism that Kazakhstan is very rich in various nature reserves. But in most cases they are closed to tourists, including due to the lack of necessary infrastructure. «For example, our Charyn canyon has great potential, our task is to create management companies and discover our beautiful natural areas for tourists. With skillful management, the money will be directed to the preservation and development of these parks.», — thinks minister. Charyn Canyon is located about 200 km from Almaty. The canyon itself stretches for 154 km along the river Sharyn. Included in the Charyn National Park. «Charyn Canyon and included in the list of geological, hydrogeological objects and the list of subsoil areas of particular ecological, scientific and other value, classified as specially protected natural areas of republican importance, according to the Government Decree of June 30, 2005 No. 657. Here are protected steep rocky slopes of the canyon, paleontological finds, including fossil animals, found in the area, as well as rare species of fauna and flora», — says on the park website.